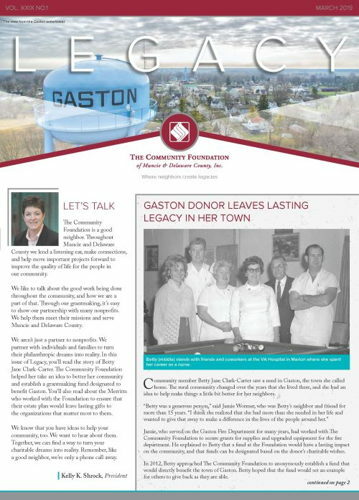 In this issue of Legacy you will learn how one Gaston resident made a lasting difference in her community though the Gaston Town Endowment Fund. This issue of Legacy is all about education. 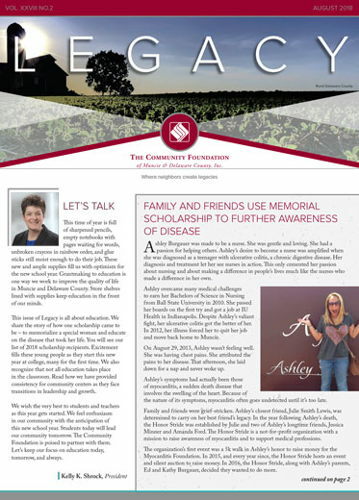 We share the story of how one scholarship came to be – to memorialize a special woman and educate on the disease that took her life. We also recognize that not all education takes place in the classroom. Read how we have provided consistency for community centers as they face transitions in leadership and growth. In this issue of Legacy, you will learn more about how we set an example and exercise leadership through collaboration. As a representative of the community, we are responsive to Delaware County’s needs in a way that allows us to remain relevant to our donors and our community today, tomorrow, and always. In this newsletter, you’ll read how The Community Foundation stands by important institutions in this community through the good times and the challenges. Looking back, we saw support of Muncie Community Schools spanning the life of the Foundation. But more than that, we saw support of programs that benefit the current students exceed a half a million dollars in the last two years alone. The children in school today will be our leaders tomorrow – a future of legacies. 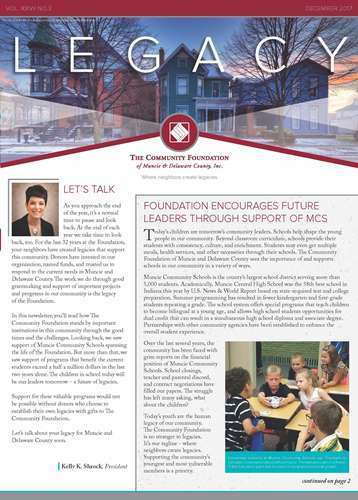 In this issue of Legacy, we focus on some of the Foundation's education initiatives. A special insert recognizes all of our 2017 scholars. The Robert P. Bell Education grants program recently celebrated 25 years of supporting teachers as they develop creative and innovative classroom projects that engage students. We also highlight the community collaboration of the 8 Twelve Coalition which is transforming the South Central and Thomas Park/Avondale neighborhoods and we recognize the non-profits organizations who received grants in our 2nd and 3rd Competitive Grant cycle. 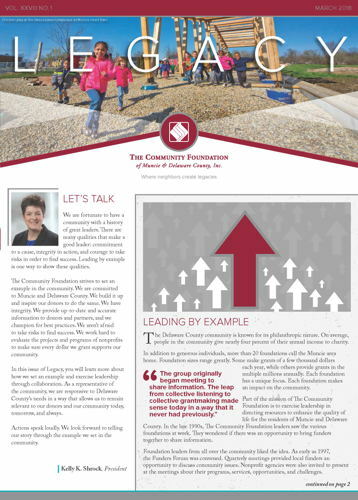 The Foundation is committed to improving Delaware County today, tomorrow and always. 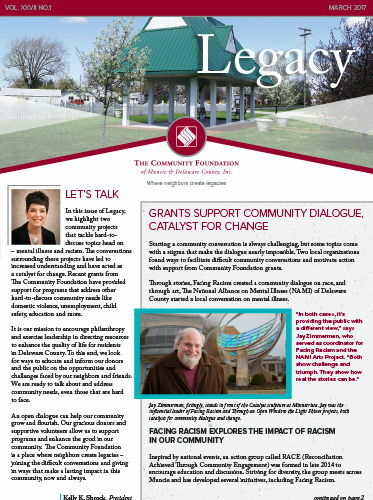 In this issue of Legacy, we highlight two community projects that tackle hard-to-discuss topics head on – mental illness and racism. The conversations surrounding these projects have led to increased understanding and have acted as a catalyst for change. An open dialogue can help our community grow and flourish. Our gracious donors and supportive volunteers, allow us to support programs, help to eliminate the bad, and enhance the good in our community. The Community Foundation is a place where neighbors create legacies – joining the difficult conversations and giving in ways that make a lasting impact in this community, now and always.